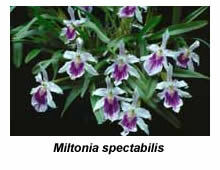 For many years the genus Miltonia consisted of two different groups of plants. Those species found in Colombia carried pansy-like flowers, while the flowers of those found in Brazil were less well filled-in. About twenty years ago it was eventually accepted that the genus should be split into two, although the idea was first suggested in 1889! 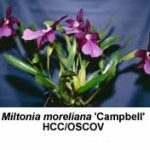 Thus the Colombian miltonias were moved into the genus Miltoniopsis, while those miltonias from Brazil were retained in the genus Miltonia. There are about ten species in the genus Miltonia, several of which will happily grow and flower in a ‘cosy’ shade-house in Melbourne. By my definition a ‘cosy’ shade-house is one fitted with a fibreglass roof, so that the plants can be kept dry during cold winter weather. They should be watered only on sunny mornings, so that their foliage becomes dry before nightfall. 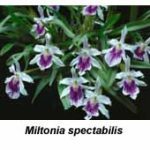 The most well known species is Miltonia spectabilis, a native of the Organ Mountains (and other areas) in eastern Brazil. In common with most other miltonia species, its pseudobulbs carry two narrow, yellow-green leaves, together with a number of basal sheaths. The inflorescences emerge from between these sheaths and bear one or two flowers with cream petals and sepals and a pink lip. My plants usually flower in January and February. Those plants grown in pots seem to flower more reliably than the one I mounted on tree fern, probably because I am unable to keep the latter uniformly moist during the heat of summer. Most orchid books feature Miltonia spectabilis var. moreliana, which has purplish flowers with a plum-coloured lip, rather than the type species. However, this variety has recently been shown to differ sufficiently from the type to be given its own specific name, Miltonia moreliana. Aside from its distinctive colour, its flowers are also larger and it is undoubtedly the most desirable of the miltonia species from the horticultural viewpoint. Miltonia regnelli has flowers that are similar in colour to those of M. spectabilis but a little smaller. It grows in eastern Brazil at moderate altitudes, and therefore it may also grow without heat in Melbourne (I have no experience in growing this species). Miltonia flavescens, which bears up to ten yellow flowers per inflorescence, comes from hot lowlands in Brazil. Although it grows without heat, it refuses to flower for me under these conditions. Miltonia clowesii has long-lasting flowers with orange petals and sepals that are marked with brownish bars and blotches. It will grow and flower without heat but does better if provided with warmth in winter. M. Candida, which has chestnut-brown and yellow petals and sepals and a pink and white lip, also prefers winter warmth. Botanica’s Pocket Orchids (2002) features a photograph of M. russelliana but I have never seen this species in cultivation. Miltonia hybrids are probably seen more often on our show benches than the species from which they were bred, probably because most exhibit hybrid vigour and can be grown without heat. Miltonia bluntii is often exhibited as a species but in reality it is a natural hybrid between M. spectabilis and M. clowesii, and should perhaps be labelled M. Bluntii. Two other common hybrids are M. Anne Warne (M. Bluntii x M. spectabilis) and M. Guanabara (M. Anne Warne x M. regnellii). These miltonia hybrids seem to do best if pot-grown, using a potting mix of medium-sized pine bark. I prefer to add a little chopped Sphagnum moss to the bark, so that the mix retains more moisture. The plants should be watered and fertilised regularly between spring and autumn but given a drier rest after flowering. They enjoy good light and make good companion plants for cymbidiums.